Directions: Emley – blink and you’ll miss it! Though the Welfare Ground is literally 50 yards from the main road going through the village of Emley, there appears to be no signage directing you to the combined football + cricket ground. So if you see a shop or a post office, you’ve arrived! And if you do like I did, and get off the bus one stop too late, you’ll find yourself about half a mile away down the hill. Buses to Emley (the number 232, operated by the Huddersfield Bus Company) are hourly between Wakefield and Huddersfield, taking around half an hour from either terminus. Off the Pitch: My original intention today was to go to Ossett Town v Frickley, but that was declared waterlogged. So instead I headed for here, after reading online that the pitch had been decared a go-er. Had just enough time to get there by bus from Wakefield, and arrived bang on kick-off time. This was my first visit to the Welfare Ground, but will certainly not be the last as it’s a great venue to watch football in. The club also benefits from a passionate local support (to which the only downside seems to be that most of them also support H*dd*rsf**ld as their ‘glamorous league’ team), and as has often been pointed out by others, were it not for the fact that the ground is shared with a cricket club and therefore three-sided, the club and the ground would surely be good enough to play at a higher level than the NCEL. As it is, their loss is the NCEL’s gain – a great venue, which today provided a hugely entertaining game of football for the princely sum of four english pounds. 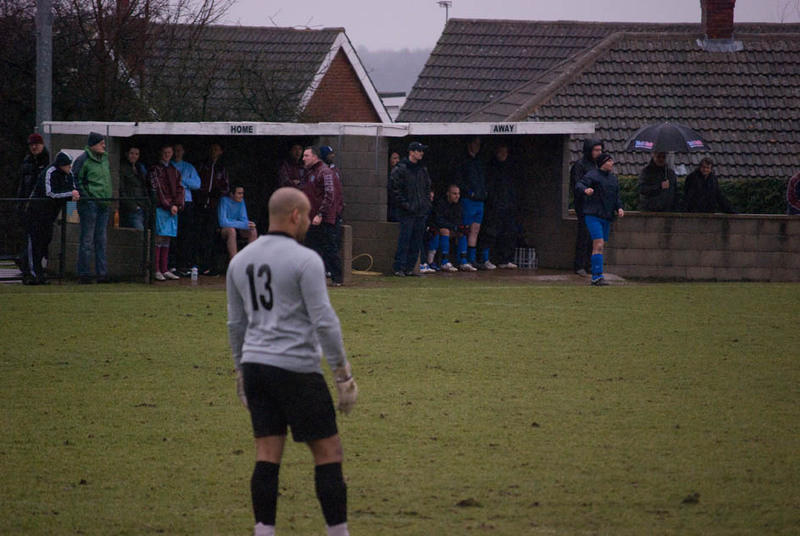 Layout-wise, there is a nice little two-in-one covered standing area behind the top goal; the opposite goal is totally uncovered; and there is hard-standing and a really impressive seated stand (which I think holds around 300 spectators) down the main side, which also has an adjoining clubhouse and a tea bar beneath it. The other side is the one which joins onto the cricket ground, and as the cricket club are joint tennants of the land, this means Emley have a temporary wooden fence a few yards from the touchline all the way along. Due to Northern Premier League (the next step up from NCEL) ground grading regulations, this is what led Emley to the groundshare idea with Wakefield a few years ago; and was and still is the reason that the club cannot progress at its current location. There’s no doubt that the locals seem happier now they have a club back in its spititual home though (following the effective ‘split’ with Wakefield), despite the drawbacks at present regarding any progress beyond the Premier Division of their current league. 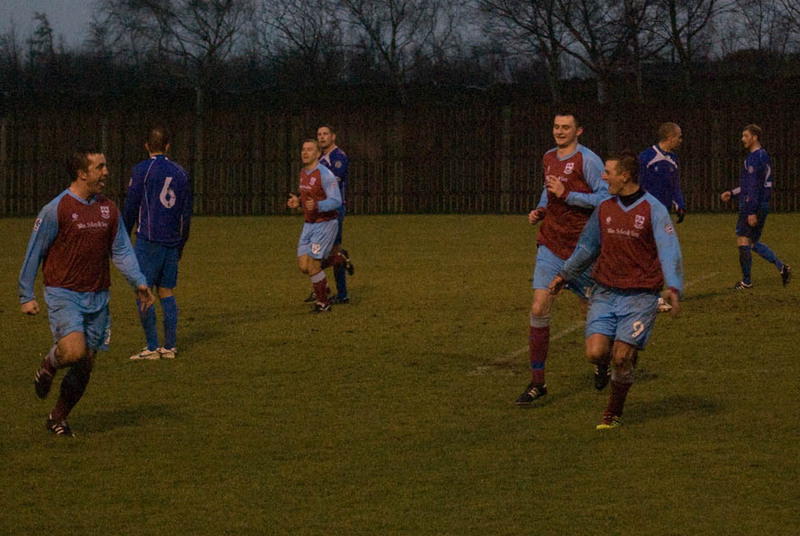 On The Pitch: Emley fully deserved the win, in a game which was a good advert for the NCEL entertainment-wise. Ponty had only lost twice in the league all season before this,while Emley were a few places off the bottom of the table. But if you hadn’t known which team was which, you would have thought it was the other way round. The match followed the ‘standard 5-goal thriller’ script, with Emley 2-0 up at half-time, Ponty pulling back to 2-2 with six minutes to go, and then Emley getting the winner a minute later. Given the weather and the increasingly cut-up state of the pitch, it was no surprise that the lion’s share of the play generally went to the team playing down the slope in each half. This also excused a few dodgy tackles, though Ponty were pushing their luck on a number of occasions. One player was lucky to escape with only a booking in the first half, for a two-footed lunge that would certainly have been a red card elsewhere. And it was no surprise when they went down to ten men in injury time as the referee’s notebook got increasingly full of names. 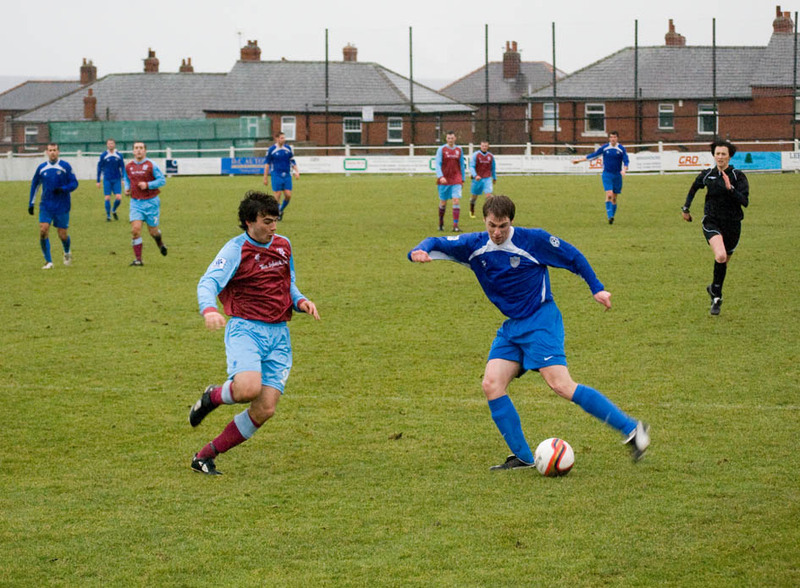 Special mention should also go to Emley’s fifth minute opener from Alex Barnes, which was a 20-yard left foot cracker from the edge of the area. 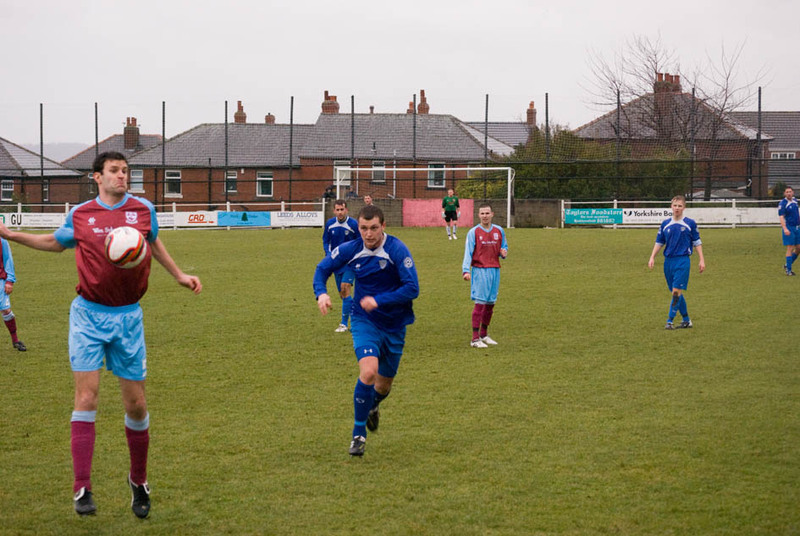 Oh yeah, and while there were thankfully no ‘snoods’ on show here today, Emley’s no.9 Steve Kenworthy came close with a dubious rollneck undergarment – which would have been grounds for scrutiny had he not bagged two goals on the day, including the late winner (see final three pictures below) and also got the man-of-the-match award. Rollnecks 1, Snoods 0. This entry was posted in Emley, Uncategorized. Bookmark the permalink.